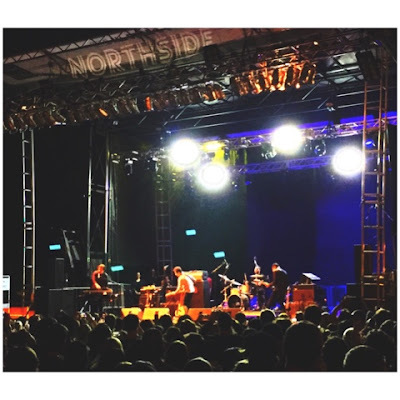 Wolf Parade helped kick off this year's Northside festival with a free show in McCarren Park. After their five-night run at Bowery Ballroom last month, Wolf Parade headed to Williamsburg for their best New York City show to date and much like the more intimate Bowery shows, the band was met with great jubilation and praise. Their spirits and energy high, the band rocketed into "You Are a Runner and I Am My Father's Son" and the crowd erupted in joy. The band looked looser on stage, the rust shaken off, and while their previous shows seemed sharper and more polished, their attitude in Brooklyn was much more free-spirited. Thank yous were dealt out by the masses and it truly felt like the band was fully engaged and excited to be reviving these tracks. It hasn't been long since the band's initial run came to a close, but their return still feels exciting. The instant nostalgic factor resonates hard for this band and much like the headliners from this past weekend's Governor's Ball, Wolf Parade conjure up the excitement of a band just rocking out. As the band climaxed with "I'll Believe in Anything", the night exploded. The shout-a-long was the most emphatic moment of the night and a pure rush of euphoria. For the encore, the band promised "one rock song and one prog-rock song" as they launched into "This Heart's On Fire" and "Kissing The Beehive", respectively. The final song was a super elongated, blown-out jam that combusted on stage with much great fury than on record. It was the band letting go and leaving all they had on the stage. A song of major proportions that just blew apart with style and grace. Even after their sold-out Manhattan residency, it was rather unexpected, but totally welcome, to see such a large crowd for a band that already feels like they could be a relic from a different era. Based on their recent EP though, it doesn't seem like the band is lacking in picking up their songwriting hats, so if their passion is as real as they appear on stage and they want to reignite the fire, it seems like there are still plenty of people who will believe in anything. Aphex Twin - "CIRKLON3 [ Колхозная mix ]"
Vatican Shadow - "More of the Same"